This book is not one that I'm reading with my book group. They are reading "Wonderful Tonight: George Harrison, Eric Clapton, and Me" by Pattie Boyd. Sounds interesting enough, but since I can't make the book club meeting in November anyway, I decided to use this month to read some stuff on my own. Which brings us to "A Three Dog Life" by Abigail Thomas. It is a memoir about the author's life, specifically about when her husband is critically injured and suffers permanent brain damage. His short term memory is gone and she must put him in a full-time care facility. She gets through the trauma of this situation in large part because of her dogs. Her husband's injury occurs when he is walking their dog, and then she adds two more dogs to her life as she is coping with her husband's situation. If you love dogs, you'll love this book. It is sweet and sad and honest. Thomas writes about the guilt that she feels for enjoying the solitude of her life after she moves her husband into the care facility. It takes a lot of courage to even admit to yourself that you are enjoying the outcome (part of it, anyway) of a tragic situation. Thomas opens up and admits to the world that she is happy with her life after the accident. She isn't happy that her husband, as she knew and loved him, is gone. But she enjoys being alone with her dogs and having peace. It is a short read, and an easy one. I highly recommend it. Even though I haven't finished it yet. 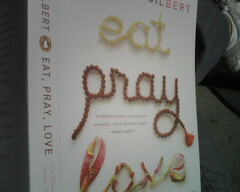 I just started reading Elizabeth Gilbert's "Eat, Pray, Love" for my book group. I'll let you read NPR's write up of it as they do a much better job at describing it than I ever could. "I eat my lunch in a quiet trattoria here, and I linger over my food and wine for many hours because nobody in Trastevere is ever going to stop you from lingering over your meal if that's what you would like to do. I order an assortment of bruschette, some spaghetti cacio e pepe (that simple Roman specialty of pasta served with cheese and pepper) and then a small roast chicken, which I end up sharing with the stray dog who has been watching me eat my lunch the way only a stray dog can." "There's not a menu. they have only two varieties of pizza here - regular and extra cheese. None of this new age souther California olives-and-sun-dried-tomato wannabe pizza twaddle. The dough, it takes me half my meal to figure out, tastes more like Indian nan than like any pizza dough I ever tried. It's soft and chewy and yielding, but incredibly thin....Thin, doughy, strong, gummy, yummy, chewy, salty pizza paradise. On top, there is a sweet tomato sauce that foams up all bubbly and creamy when it melts the fresh buffalo mozzarella, and the one sprig of basil in the middle of the whole deal somehow infuses the entire pizza with herbal radiance, much the same way one shimmering movie star in the middle of a party brings a contact high of glamour to everyone around her....You try to take a bite off your slice and the gummy crust folds, and the hot cheese runs away like topsoil in a landslide, makes a mess of you and your surroundings, but just deal with it"
I'm afraid that if the section on spiritually in India is as enticing as the eating party of the story in Italy, I may be shaving my head and wearing an orange robe very soon. I'll be sure to post photos if that happens! KABUL, Afghanistan (AP) -- The deadliest insurgent attack since the U.S.-led invasion of Afghanistan in 2001 destroyed a bus full of police instructors at Kabul's busiest transportation hub on Sunday, killing 35 people and wounding 52, officials said. This is a headline from the NY Times yesterday. 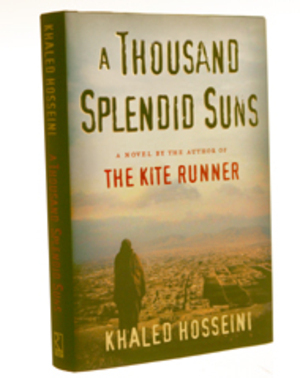 As I finish the last few pages of "A Thousand Splendid Suns" by Khaled Hosseini (author of "The Kite Runner") I am struck by how the Afghani people are still living in war, much like they have been for the last several decades. Is it just my American naivite that lets me believe that things MUST have gotten at least a little better since 2001? When I read reports like this one and realize that the Taliban is gaining strength again, I can't help but think about the fictional stories I've read about the region. After reading "The Kite Runner" a couple of years ago, and other works since then like "The Bookseller of Kabul" and "The Swallows of Kabul", I have only just begun to understand what life is like for our sisters there. Clearly, it is not limited to Afghanistan, but since 9/11, that is where much of the focus has been; there and in Iraq. And now Iran. "A Thousand Splendid Suns" tells the tale of two women from two different generations in Afghanistan whose lives become entangled. It is largely a story about Mothers and Daughters. It is also the story of the contrast between pre-soviet and then pre-taliban Afghanistan and what it is like after the oppression becomes all-consuming under Taliban rule. The power in it for me, though, is knowing that stories like this one are still being lived, not just told. It makes me sad. I am in awe of the resilience of the people who survive years, even generations of war and violence. I'm also struck by the history that has been lost to war; the art, architecture and spirit that is damaged or destroyed. This book is a good, solid read. It gets deep into the story much quicker than "The Kite Runner" did and keeps you going...the end is a little slow. I think it goes on a little long after the key parts of the story are wrapped up. Kind of a neat and clean ending to an otherwise complex story. I tend to like endings that keep you wishing you knew what happened next. My book club met last week and we picked our next two books (for February and March). We also discussed having just a little bit more structure. We've been pretty loosey goosey for the last year or so. Mostly the changes are around how we select the next read and how much time we spend socializing at meetings vs. actually discussing the book. We noted that the amount of time spent socializing is usually directly related to how good the book was and how anxious we were to actually discuss it. We decided that meetings start at 7:00, discussion starts promptly at 7:30. Then we have 1.5 hours to discuss. If the book was engaging, we will use the whole time. If it was not, we can re-convene the socializing and/or call it an evening. "...there was another tradition to politics, a tradition that stretched from the days of the country's founding to the glory of the civil rights movement, a tradition based on the simple idea that we have a stake in one another, and that what binds us together is greater than what drives us apart, and that if enough people believe in the truth of that proposition and act on it, then we might not solve every problem, but we can get something meaningful done." There is a good post on Berkeley Bubble about Obama including links to his 2004 Key Note Address to the DNC. 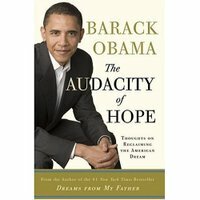 A must read for everyone in America. Nickel and Dimed: On (not) Getting By in America by Barbara Ehrenreich has changed not only how I view the working poor, but it has changed my life. Not in any hugely dramatic way, but in ways that I hope make life a little easier for some folks. This is the story of an upper-middle class woman with a Ph.D. who wants to see how life adds up when you are working an entry level (read: minimum wage) job and trying to pay rent and eat. Did you know that in some states, a person who works in a "tipped" position (waitress etc.) does not make minimum wage PLUS tips. The tips they get are applied to their hourly wage up to the point where they are only making $2.13 per hour plus tips (assuming their tips plus wage add up to that state's minimum). Florida is one of those states, California is not. Sometimes the difference between make it or break it for these folks can be $10 a month. Think about that the next time you are wondering how much to tip your waitress, or the people washing your car at Ducky's, or the next time you stay at a hotel with maid service. Oh, ya, did I mention that the maids at hotels are often paid by the room, not by the hour...so clean up after yourself a little better. The sooner they can move on to the next room, the better. Did you know that a lot of maids who work for a maid service (that come to your home and clean) are independent contractors and therefore do not get medical benefits and are not covered by worker's comp insurance? This in an industry with a high probability of repetitive stress injuries, and other more acute injuries. This infuriated me. I can't do the book justice in a brief review. It is about 200 pages long and it is a very quick read. The author does not pretend that she is experiencing this lifestyle the way that most people really are. Even though she doesn't use her education, experience or credentials to get a job, she still has a Ph.D. and money in the bank, and has an "out" whenever she wants to. She also allows herself enough money to get a "rent a wreck" so that she has transportation (a luxury many people don't have) and enough cash to pay for first month's rent and deposit. She also starts her journey in good health and with a high self-esteem. Again, both are luxuries that many people do not have. Barbara Ehrenreich has also written a book called Bait and Switch in which she examines what happens when you've "done everything right" (gotten a college degree, etc) and are a middle-class, white collar worker looking for a job. Ehrenreich writes with an easy style and a subtle wit. Read it (them). It'll make you think. 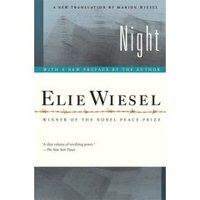 Elie Wiesel captivated me from page one. I'm not well read on the topic of the holocost having only read The Diary of Anne Frank, seen Shindler's List, and been exposed to the typical amount of information that most sub-urban US folk are. When I read Anne Frank's diary however, I was a child myself and really could only grasp so much. As an adult (I really should re-read the diary) I believe that it would touch me deeply. When I picked up "Night" to read for my book group (I know, it's an Oprah book choice and as much as I really love Oprah, for some reason I find it hard to admit that I am reading so much from her list), I was anticipating a really difficult read. I read the introduction (which I don't usually do because I'm so anxious to dig right into the story) and was fascinated by the story of the story itself and how it got published (eventually). From the very begining, this book reads very quickly and is so vivid and alive. Ironic that it is a story that is surrounded by death because what you feel throughout is a sense of life in spite it all. I found myself so caught up in Elie's day to day struggles and observations that I almost loose sense of the time that is passing. I think this is a great companion piece to Anne Frank's Diary for high schoolers, especially since it is written from the point of view of a teen-aged boy. I've heard some boys resist reading Anne Frank because they think it will be about girl stuff. I would like for both of my boys to read this. "What is the relationship between our stories and our identity?" and "To what extent are we all witnesses of history and messengers to humanity?" Food for thought, and perhaps for another blog entry. This isn't your typical sob story about an addict who is trying to put his life together. It is a powerful, graphic, minute by minute account of a rock-bottom situation. James Frey, the author and the the main character (it's not fiction folks). I'm only about 50 pages into this book and already I can feel the pain, the helpless, hopless feeling. I highly recommend it even though I have just started it. A far cry from The Bee Season and The Other Boleyn Girl. This is meaty and real and shocking. I've heard that if you or someone you know is or has been an addict of some kind, you need to read this book. A Million Little Pieces is worth your time. Let me know what you think. Brian over at The Bay Area is Talking broke the news (for me at least) that our beloved Kepler's is re-opening next Sat! This is beyond good news. For those of you who aren't Bay Area locals, Keplers is an independent bookstore that has been open for 40-50 years and had recently shut it's doors because it could no longer compete with the Monster Big Bookstore Chains. There was a huge outcry and some angel investors have stepped in to save it. The news now is that it will re-open on Oct. 8th! The world is a good place. Now I just have to figure out how the heck I'm going to be able to find the time to volunteer to make this happen.